Where have you been in GA? Georgia has many more towns and cities than Atlanta and its metro. So where have you been in Georgia outside of the Atlanta Metro? Been to Columbus, Augusta, Macon, Athens, New Brunswick, & Savannah. Atlanta is still my favorite! Georgia is my favorite state to visit. I've seen most of Atlanta's metro, from Kennesaw Mountain to the historic Gwinnett County Courthouse and from all angles. The one Georgia city I most want to visit, but haven't been to, is Matt, GA. It's on Matt Highway off 400 in northeast Atlanta metro. I want to take my picture infront of the welcome sign to use on profile pages. I also want a photo of the sign for an avatar. I've been to every corner of that state. I've always wanted to stop by Milledgeville, the former capital of Georgia. I have been to Augusta, Demorest(creepy back in the days feeling), and of course Atlanta and the cities in between it and Greenville. Really though, I been through alot more towns than I have listed, but my list is based on places I have stopped in for some reason. The highest peak in Georgia is located there, complete with an observation tower. *If you like the Northeast Georgia Mountains, be sure to take the Appalachain Trail to Blood Mountain sometime. Macon, Milledgeville, Dublin, Augusta, Brunswick, Statesboro, Hinesville, Atlanta. I know very very little about Columbus, I'm interested in seeing it someday. I've been through Dublin--"Home of the SHO NUFF", along with a bunch of other small towns along the way to McRae. Wow, what a trip that was! The difference between Atlanta and the rest of Georgia is staggering. Haha, I think McRae is the town with a nice center square, with a very visable confederate memorial, with a 3rd Flag of the confederacy and everything. Its either that or Louisville. I can't recall. If you live in upstate SC, you've got to visit the northeast of Georgia. One of my favorite getaways is the small town of Helen, a tourist attraction where all of the buildings have been given an alpine look. The place is especially bustling with pedestrian traffic on holidays. There are many things for the whole family to do there in the warmer times of year. Hartwell - BEST stromboli I've ever had was here. Douglasville - It's nice to have family so close to Six Flags! Lawrenceville - The town was nice, but the highway signs were rediculously confusing! I really want to visit Savannah sometime, since I've read a bit about it. Been to Atlanta far more times than I can remember (have family there). I lived in Augusta GA from Summer 1991 to Spring 1994; too far from the water for me but a nice place. I collect county courthouses, and in so doing I've stopped in about 100 of the 161 courthouse towns in Georgia, and I've set foot in all but a dozen of the counties. Dooly County (that's Vienna, on I-75) has I think the nicest courthouse in the state. Atlanta is... well, Atlanta. But I have always had a soft spot for Swainsboro, and I really rather liked Blakely, Thomasville, and Decatur as well. Americus seemed nice, too, but then there are all the old stories about Americus. However, my very favorite place in the whole state is Adel, in Cook County. The town of 5,000 has just seen a nice three-story glass "tower" put in to house the Lenox State Bank corporate offices. It's a good trend. And... Washington - where my wife & I married over 5 years ago. I rather enjoyed Americus. It has such an interetsing downtown, and "skyline" if you go to the right place. What are some of the stories about it? 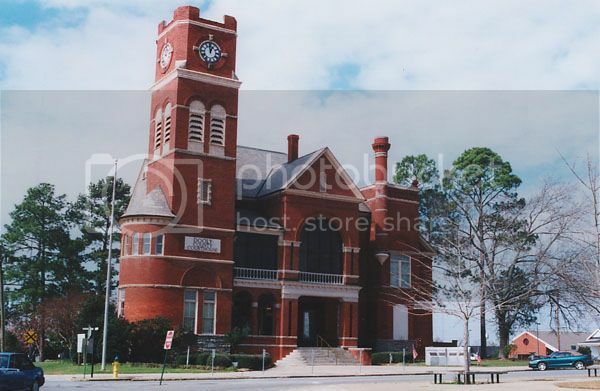 I enjoy the courthouse towns of GA as well. 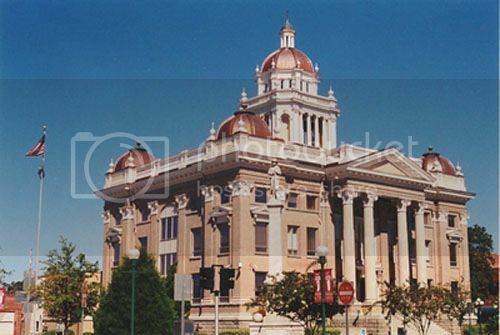 I would be interested in seeing some photos (I'm assuming by "colect county courthouses" you mean photos of them ). There are several nice ones that I have seen, but I an't recall what they are. Well, here's a picture of the courthouse in Dooly County for you. Vienna's not much of a town, really, but it has this magnificent structure, by William H. Parkins. And, just an hour's drive down the highway in Valdosta is this Frank Milburn beauty, often considered the most beautiful in the state (I do prefer Dooly, though). I would like to see any you care to share. Do you have any of Americus?